Within months of the beginning of the Oblates ministry at the sanctuary, they were able to see results with an increase in the number of pilgrims and a deepening of their devotion. Like you I have offered praise to the Lord for the graces bestowed on the house of l’Osier. It is with much satisfaction that I hear from you once again that devotion at the sanctuary is on the increase and growing in depth. Then Eugene underlines the reason for this: the quality of the religious life and witness of the missionaries. It is the result of their regularity and fidelity to their Rule of Life which ensures faithfulness to their vocation and to the Savior who called them. I am lost in admiration at all you tell me. Give thanks for it to the good God and the Holy Virgin, and continue to make yourself worthy of this powerful protection, by an exemplary life and diffusing abroad the good odour of Jesus Christ and giving signal proof that there are yet men who, amidst a general demoralization that infects even the clergy, have known how to understand the ways of this divine master and to follow his counsels faithfully. Every day Eleanor Rabnett , a member of the Mazenodian family in Ottawa, Canada, responds to the reflection of “St Eugene Speaks” by sharing her reactions (see http://www.eugenedemazenod.net). Once again I begin by going to the Historical Dictionary to read about Bishop Bruno Guigues OMI before attending to this morning post for reflection. I readily recognize the original spirit of Eugene de Mazenod within Bishop Guigues and how he made it a part of himself. No mimicking St. Eugene but rather living and sharing that Mazenodian Spirit. Called to share this beautiful charism with all those he met. I am struck that he was not just a copycat image of Eugene de Mazenod but how in the way of all holy men and women he absorbed the gift of Eugene’s charism and spirituality, making it his own and living it as he had been created to. I recognize Eugene’s light being shed upon Bishop Guigues and how he in his own way shed his light on the Oblates and all he met and cared for. He ensured that the charism remained relevant and alive here in Canada by his very life. I am a little amazed, awed at the sentiments that rise from within me as I consider the immense gifts that we have received and how we give that back. This congregation, indeed this Mazenodian Family which began a continent away and was so instrumental in building our country (like the threads of a tapestry of life all interwoven to make a vast and full picture of life) and then spread back out into the world at large. I look again and see how the lives of men such as Bruno Guigues OMI connect with and play a part in each of the lives of those who make up the Mazenodian Family; in our lives within the Church and within our local communities – all of which intersect with each other becoming a part of a greater whole. In the midst of all the trials and joys that will make up this day, I feel blessed with joy and gratitude. Lord, let all that I am and do today be a lived ‘giving thanks’. We have been reading about Father Guigues in recent letters, so let us pause to find out more about this extraordinary Oblate missionary. Born in 1805, he was too young to make his oblation after his novitiate, and had to wait until his 18thbirthday to do so. Ordained a priest at the age of 23, he did several ministries in Aix and Notre Dame du Laus until in 1834 when he became the first superior and pastor of Notre-Dame de l’Osier. Through his considerable abilities he was able to restore that place of pilgrimage materially and spiritually. In 1844 he was sent to Canada as superior of the Oblates who had first arrived there three years before and were badly in need of better organization. It was he who did this and who sent the Missionaries further inland where there was great need. Three years later, he was appointed Bishop of Bytown the town which would later be called Ottawa. “When he arrived he found an unfinished cathedral, three stone churches and about fifteen wooden chapels. Seven diocesan priests and seven Oblates constituted the clergy of the diocese. He immediately got down to work and, at his death, there were 67 churches, 48 chapels and number of schools. He then had 53 diocesan priests and 37 Oblates. Education for young people was one of his primary concerns. In September 1848 he opened a college and a major seminary in Bytown. In 1856 he built a new college in stone on the site of what is today the University of Ottawa. 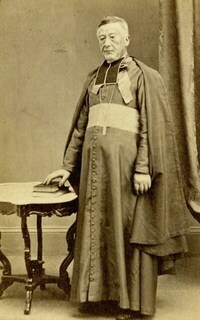 Father Joseph Tabaret was appointed superior. The direction of the college was entrusted to the Oblates who retained it until 1965. Father Guigues is entrusted with the responsibility of keeping everyone in the community focused on the spirit and letter of their God-given vocation, as expressed in the Rule. The only appropriate expression of the gratitude we owe God for this miracle is a firm resolution to walk always in his presence according to our vocation, in the exact observance of our Rules. This is your responsibility, very dear Father Guigues, the man I have named superior of this new house and to whom I am confidently imparting a large share in the solicitude that is mine. It is for you to open the Rule book so that each one may draw his inspirations from it, and knowledge of the style of conduct he must pursue. Put aside all counsels of human prudence. There is no true wisdom outside the fulfilment of one’s duties, and duties are fixed and sanctioned by the infallible authority that has imposed them. Let the introduction of the least abuse be anathema to you. God would call you to account for it, for it is you who are to build the foundations of the new community, and it is vital that it diffuse abroad the aroma of Jesus Christ. Why do all this? To allow the perfume of Jesus Christ to fill the world. The image that comes to mind is that of incense and how its smoke and smell permeate everything around. This is the vocation of the Mazenodian missionary: make known the beauty of the presence of the Savior in people’s lives. My dear Father Guigues, I have just left the altar where I offered the holy sacrifice in thanksgiving for the happy conclusion to the affair that means so much to us. Father Vincens is bringing you the copy of the letter the Bishop of Grenoble has just written me. See how the Master of hearts leads them as he wishes and join me in praising the Lord. Father Dupuy, on becoming pastor of N.-D. de l’Osier had, it seems, set about forming a community of diocesan priests to serve the Sanctuary. When the Founder understood what was going on, he wrote to explain the situation to Bishop Bruillard on August 8. 1834. Keep me up to date in everything and consult with me often. Father Dassy will make the superior’s task easier by his obedience and his zeal for regularity. He will be his cooperator in laying the firm foundations of an institution that can prosper and bring honour to our Congregation only in so far as it is instituted on this basis. Keep in mind furthermore that Father Vincens whom I am going to send you has been with us only a year; slackness will either scandalize him or lead him astray down a path diametrically opposed to what he has been taught is the only one by which the Society’s goals can be attained. Notwithstanding our poverty, as soon as we get more priests. I will send you another one. “Regularity” refers to following the Oblate Rule of Life (“regula” – hence “regularity” is following the Rule and guiding one’s life by it). A young and dynamic community would attract many people to the sanctuary devotions and sacraments, but also to visit with the Oblates. Eugene here gives an important piece of advice: do not let an exaggerated number of visitors become a distraction to their religious lifestyle. If the number of visitors is found to be a disturbing factor, steps should be taken to preserve regularity, notwithstanding that. There will be more edification through fidelity like that than from an over-politeness that would entail wasting a considerable amount of time and a lot of disturbance. Advice that continues to be relevant for today: while being close to people we need to keep focused on the witness we should be giving and WHY we are close to them. THE RULE SHOULD BE FOLLOWED IN ALL ITS DETAILS AND BY EVERYONE. Eugene had placed great responsibility on the shoulder of the 29 year -old Fr Guigues: to assume responsibility for the Marian shrine and to work at increasing the number of pilgrims and to ensure that the Oblate community ran smoothly in accordance with the Oblate Rule. I want Father Guigues to have a thorough grasp of all the obligations incumbent upon him. If he fails to institute perfect regularity in his community, he will have to answer for it to God and the Society. I permit no re-interpretation. To make up for his inexperience he was to ensure that the three young Oblates lived according to all the prescriptions of the Constitutions and Rules. Thus it would be the Rule of Life that would be the guide, and not the whims and ideas of the superior. Good advice that is still pertinent today in our communities.